INR likely to open around 71.15. The Rupee has regained some stability post the budget and the RBI cut. Global environment is also fairly docile for now, as markets await the outcome of the talks between China and the US starting today. The Dollar is strong against most currencies, especially the EUR. As more and more data is showing that a slowdown is spreading across EU countries, markets are reassessing the relative dovishness between ECB and the Fed. EUR is trading at 1.1325 level and USDJPY is flattish at 109.80. Brent is flat from Friday level at around 61.50, and it has given up Friday’s gains today. This week is very critical for oil due to China talks. The commodity is torn between slowing global growth and supply concerns around Venezuela and OPEC action. This week’s data has US CPI, among other releases. Also crucial is the fact that the temporary spending bill to re-open the US government would expire by this week. If the funding for border wall is again missing, it possible that the US government would be again shut down, leading to some risk aversion. For now, INR is in a stable position, but would obviously react to any unexpected news around China talks. The Dollar continues its unrelenting strength, reflected in EUR trading at 1.1280, GBP below 1.29 and USDJPY at 110.40 level. Post the Fed, USD has been on a bullish spree in spite of their complete dovish tilt. It seems it is now a race among central banks as to who is most dovish of all. The general sense of caution among most global central banks should be positive for INR and other emerging market currencies, but the Rupee also has the election uncertainty to contend with. China-US talks are currently underway and markets are not sure what to really expect. CNY has depreciated since Chinese markets opened after their new year week. USDCNH offshore is currently trading above 6.80. Brent crude is flattish from yesterday level, trading at 61.70. One can expect some volatility in currencies and oil on headlines around China talks. 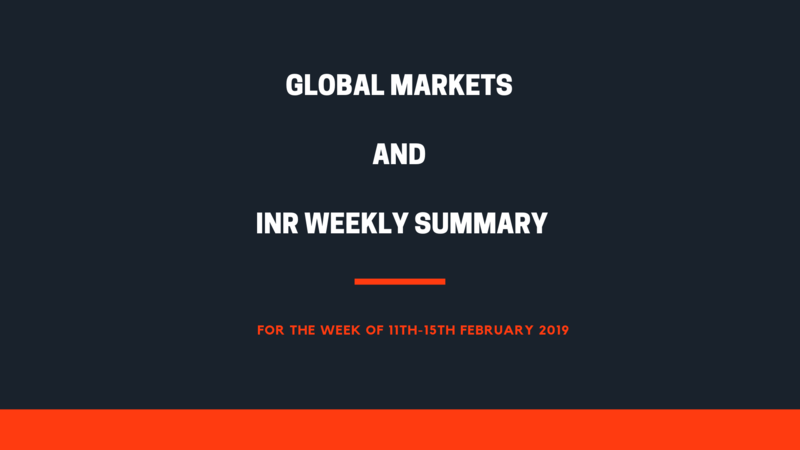 INR is fairly stable for now but could be prevented from any meaningful appreciation by trade war caution and the general Dollar strength. A combination of factors has led to a sudden shift in momentum with a sharp INR appreciation and a weak Dollar yesterday. There was some positivity around the China talks and the same got confirmed when Trump mentioned he can let the March 1st Deadline slide if there is progress on the negotiations. US markets jumped on news that the US Congress has agreed on a deal which includes some funding for the wall, to avert a government shutdown. All risk assets reacted positively. EUR is back above 1.13, trading now at 1.1330. INR would be helped by the risk appetite and the fact that the recent range of USDINR is broken to the downside, but oil price (Brent now at 63.00) is one factor to watch out for, if there is more good news about China deal. Data has shown that there were sizeable cuts in OPEC production in January. Over the medium term, if China deal gets done and as Iran sanctions again come back to focus, along with Venezuela and further OPEC cuts, there is a good bias towards an upward move in oil. India inflation came in almost close to 2%, and markets would expect another rate cut from RBI in the next meeting. This is a positive for INR. Today’s US CPI is expected to be lower than previous print. A low US inflation would keep the Fed stance going for a while longer. The broad Dollar strength, which appeared to be a headwind for INR, has now subsided a bit suddenly on positive headlines. Powell made comments yesterday, expressing confidence in the US economy. It would be interesting to see if the Fed can remain very dovish if China deal gets through and the border wall stalemate ends for good. Our view is that the primary risk the Fed is afraid of is the performance of the US equity markets and in that context, a sustained up move in US equities can again change their stance over the next few months. INR is now in a sweet spot and can potentially see a bit more appreciation due to momentum. But crude prices could keep the Rupee from a run-away appreciation. After a sharp appreciation, the reversal in USDINR yesterday goes to show that there are opposing forces tugging at the Rupee, not allowing any large appreciation in INR. The Dollar has come back strong again yesterday, with EUR back to trading at 1.1260. News that there could, after all, be a US border funding deal and mild caution around the deal with China helped the Dollar reverse its losses. Crude continued its move, now trading at 63.90 and INR would be pressured by this. Our view continues to be that, a deal with China has the potential to push crude higher towards 68-70 USD range, offsetting any positive effect on INR. US CPI came in at 1.6%, as expected, and core inflation was higher at 2.2%, supporting the Dollar. Fed could afford to be dovish for now though the inflation is higher than their target, but a China deal could push up US exports and economy and force the Fed to change its stance. The short term range on INR continues. The Rupee is back above 71 as oil continues its surge. Brent is now trading close to 65, as hopes of China deal coincide with expectations of lower supply. The Dollar is flattish against EUR, at 1.1290 and weaker against JPY, at 110.30. US retail sales came in at -1.2% against 0.2% expected, resulting in risk aversion and JPY strength. US politics is heating up, as Trump is expected to proclaim national emergency to build the wall, even as he signs the funding deal agreed by US Congress/Senate. Since the government shutdown is averted, any legal battle on this aspect would not be a very critical factor. China talks continue amid reports that Trump is considering an extension to the truce deadline by 60 days. INR would be pressured a bit due to the terrorist attack in Kashmir. Overall, the positivity of the past few days is now dominated by oil price, and INR is back in its range.